Whoever said that organic makeup was only for hippies, had obviously never set eyes on anything from Kjaer Weis. This luxury, eco-friendly cosmetics brand can easily compete with any of the big designer names, and its packaging and shade ranges are simply to-die-for. For those of you who are new to Kjaer Weis, KW do things a little differently to other makeup brands out there. Their small but perfectly formed range is composed of beautifully crafted, metal refillable compacts complete with a selection of products to put into them. Whilst I know that refillable compacts are nothing new, I have yet to be wowed by another brand's packaging as much as I am by Kjaer Weis'. The metal compacts have a satisfying weighty feel about them (seriously, it's heavy! ), the underside of the lid also conceals a handy little mirror for touch-ups on the go, and then there's that clever little opening twist mechanism that has an equally satisfying click when you close it. It is sheer perfection in packaging form. But enough about the packaging - what are the products like? 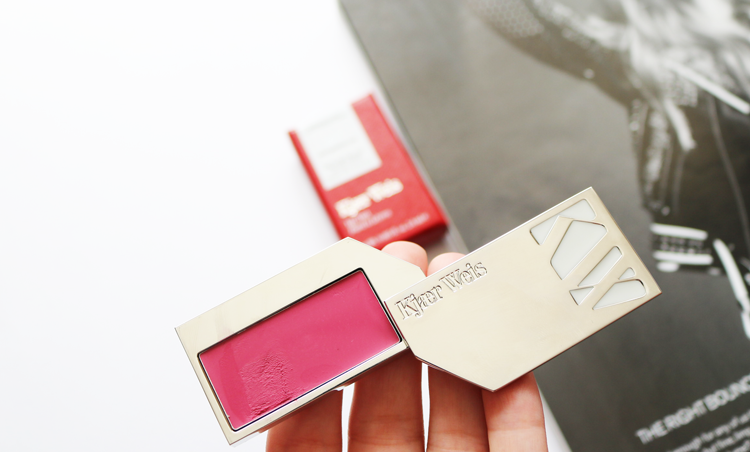 Today I've got one of their Lip Tints in the shade Rapture to share with you all. KW's Lip Tints are composed of mainly naturally derived ingredients, with a minimum 95% of those coming from certified organic farming. They're free from the usual culprits such as petroleum, parabens, artificial fragrances, petrochemicals etc, but some shades (including Rapture) do contain a tiny amount of artificial pigment so check out the website before purchasing if this is something that concerns you. Rapture is a bright fuschia pink with blue undertones that has a 70s It girl vibe to it. It's one of those shades that looks a little daunting in the pan because it's so bright, but on the lips, I was surprised by how wearable it actually is. I don't often reach for these sorts of colours which is why I wanted to try it out and I love it! The texture is creamy and it feels moisturising on thanks to ingredients such as Shea Butter and Jojoba Seed Oil in the formula. It's a lot more pigmented than I was expecting from a lip tint but you can use it in different ways to get the finish that you want e.g use a lip brush for a full on lipstick effect or use a clean finger to simply dab on a little for a wash of colour to achieve juicy looking lips in a matter of seconds. Longevity wise, it's worth bearing in mind that this is a lip tint and it doesn't make any other claims to be anything else, but I found that it wore well for around 2-3 hours without eating/drinking before starting to fade evenly. It'll require touchups throughout the day but do you really need an excuse to whip out that beautiful compact in front of your friends?! A great shade for Spring/Summer as it instantly brightens up my whole face without the need to wear much else makeup wise. Perfect for balmy summer nights and those hot days when you don't want to wear a full face, but still want to look good. 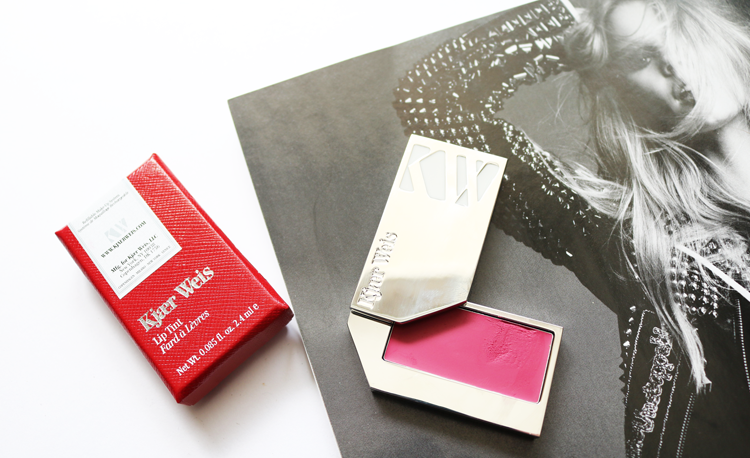 Kjaer Weis Lip Tint in Rapture* retails for £34 with its metal compact, or £19 on its own. Available from naturisimo.com who offer free worldwide shipping. 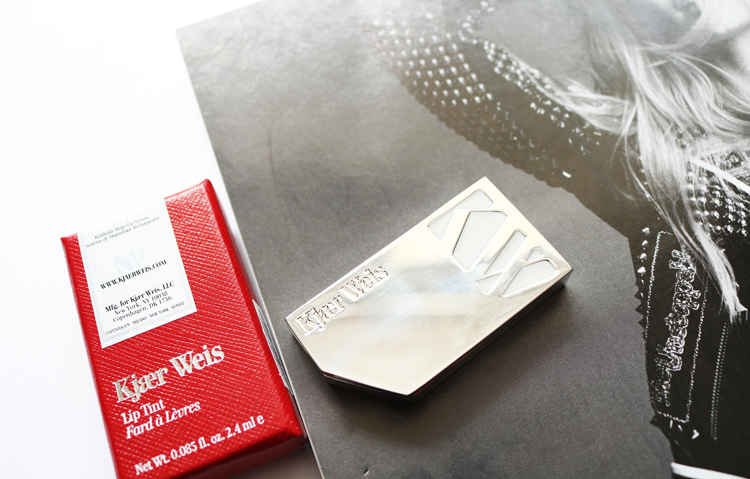 Do you own anything from Kjaer Weis? Any other of their products that I should be checking out? So pretty!! I've always wanted to try one of these! Thanks for the review! They are amazing - you'd love them Tracy!